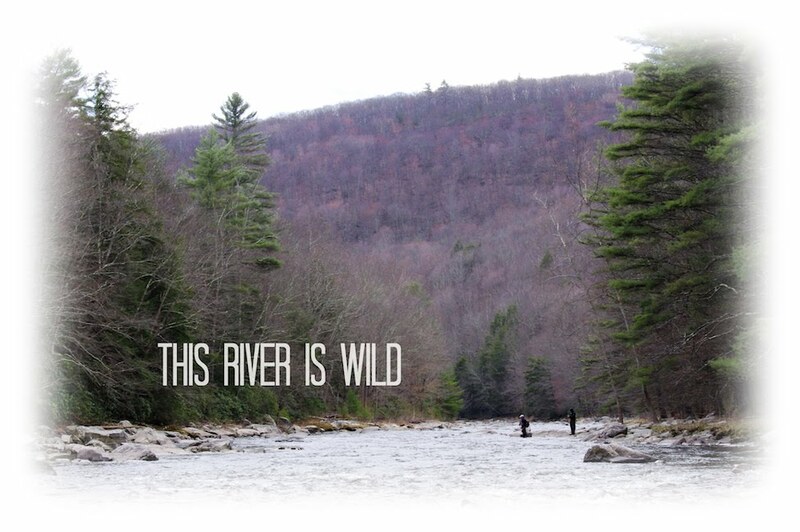 This River is Wild: Full Circle. I distinctly recall a memory of my childhood where at the tender age of six, I had a particularly outstanding day of fishing. 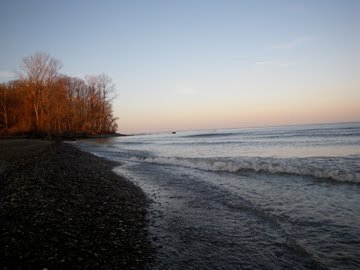 My brother and I were taken on a trip north into Canada by my grandfather and my father to do some fishing at a friends cabin. Along the way we toured several sites including an old stone fort. At that age, I did not know that my grandfather served in WWII and I had no idea what the fort was, so that part of the trip is a little hazy. What I do remember is the harmonica my grandfather bought me and how I played it (horribly) non-stop for most of the trip. It was enough for me to garner the nickname, "harmonica man." It probably drove everyone on the trip insane but for a six year old, it was the greatest present ever. I also vividly recall waking up early one morning, walking on some wooden planks through a swamp, and then out to the edge of a boat along an eddy in a very large river. My brother and I set up shop at the edge of the boat and dangled our legs off the edge. For the remainder of the day we set possibly a world record for number of blue gill caught. The process resembled an assembly line. My brother and I were the bosses that reaped all the rewards while my grandfather and father were the ones that did all the work. My brother and I would drop our bobbers and worms off the edge of the boat, wait about a second for it to dip, and then lift a small blue gill over the edge where our elders would release the fish. They then dug through a large Styrofoam container for a worm, baited the hook, and untied any tangles we conjured on our lines. My brother and I happily dipped our rigs back into the water and immediately caught another blue gill. This process repeated itself non-stop for the remainder of the day. I quite possibly caught more fish that day, then any day since combined. For us, it was sheer exhilaration. For my father and grandfather it must have been beyond tedious. Later in the trip, another memory can be recalled like it happened yesterday. We were out in the middle of the river on the boat. My push button rod and reel dangled precariously over the edge. In a momentary lapse of judgment (or sheer boredom) I lost control of the rod and it dropped into the depths of the river. My favorite rod, disappeared before my very eyes. My grandfather was angry but he didn't let it show and I was left without a rod. A year later, my grandfather went back to that cabin and when he returned home, he brought my rod back to me. He accidentally snagged the exact rod I dropped in the water a year prior. To my amazement and sheer joy, I watched him slowly clean the rod and return it to working condition. I used the rod for several years before it reached retirement. Two Fathers Looking For Their First Steel. 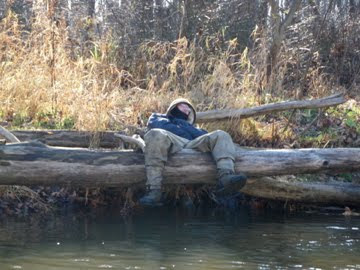 Big Poppa Pump Couldn't Handle Dawn To Dusk Angling. 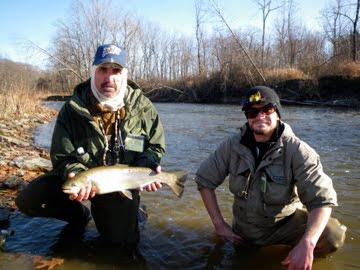 Gil's First Steelhead & One Proud Son. Fast forward to today and the situation is now reversed. My grandfather has since passed away, but my father has taken the place of my brother and I on that boat sixteen years ago. I am the experienced fly fisherman while my father is the noob. 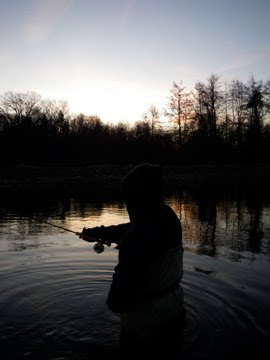 I am taking him on a trip to Erie for steelhead and am hoping to recapture the excitement of that day in Canada in order to create a lasting memory for the both of us. 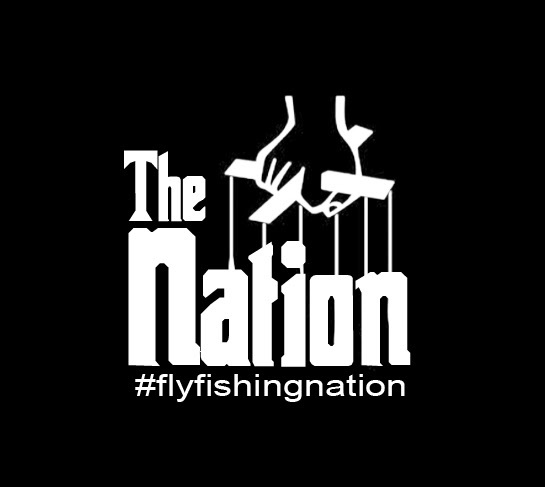 I find myself on the assembly line tying flies, rigging rods, untying tangles, and instructing my father's every move. I am guiding him over rocks and ledges, telling him to be careful and watch his step. I am correcting his every cast, hoping and waiting for a take. 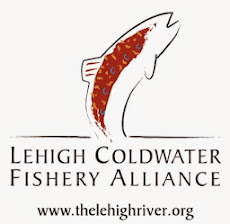 Everything has gone full circle and we are in the midst of a steelhead trip to Erie. On the morning of day three, my father and I find ourselves on our own heading out for one last shot at some steel. We reach the parking lot early and meet a crowd of anglers. The long hike to the mouth of Elk creek takes quite sometime. 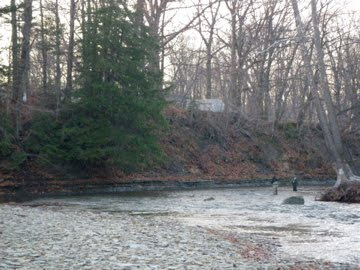 We are passed by several anglers too impatient to wait for my father scrambling up the muddy single-track. We arrive at the mouth to find at least twenty anglers already fishing. I notion to my father to follow me and I ease him into a spot on the edge of the crowd. 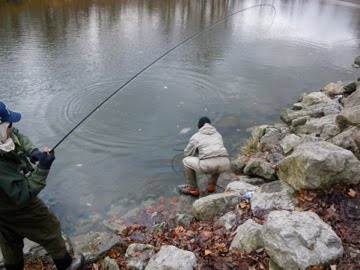 I patiently rig up his rod and instruct him on the way I would like him to fish the spot. 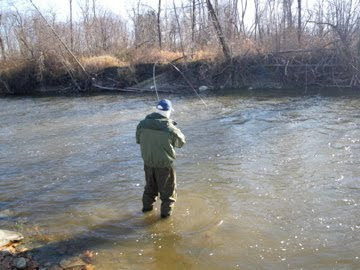 He unrolls a long roll cast to the opposite bank and immediately mends upstream. I no longer have to tell him what to do. As the rig drifts downstream, ever so slowly in the low flows, he mends to keep a dead drift. The indicator dips and he ties into a nice slab of steel. I bark out orders and make sure he follows directions. We are not going to lose this fish. 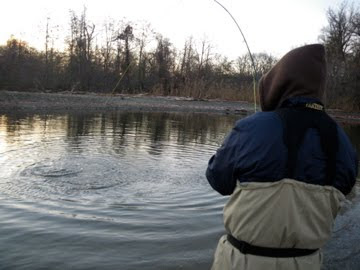 Slowly he works his way up the bank and guides the steelhead onto a sandy ledge. I gently slide my hands under the fish and my father's first steelhead is successfully landed. Big Poppa Pump Angling @ Dusk. 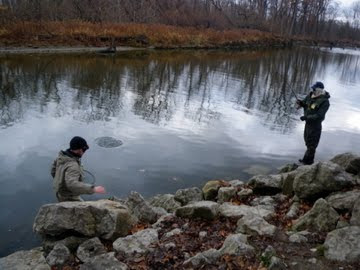 Launching a Rollcast To The Opposite Bank. 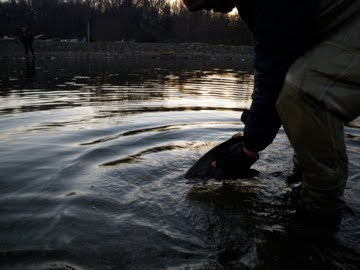 As he releases the fish back into the chilly waters, I am transported back to Canada and the blue gill of my youth. I finally understand why my grandfather and father were able to withstand my brother and I catching fish after fish. I understand why they were able to listen to me brutalizing a harmonica in the back of the old Mercury. It was for those small moments when my brother and I pulled a blue gill over the back of that boat. It was for the smile that would creep upon our faces from the fascination of a fish, and our ability to catch it. 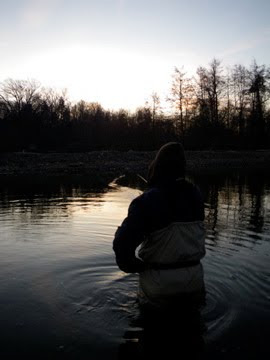 As I watch my father release his first steelhead, I can only hope that the memory of this fish will stay with him forever. Just like the memory of one of my first fishing excursions has remained with me. Doing Battle. Will This Be The One? 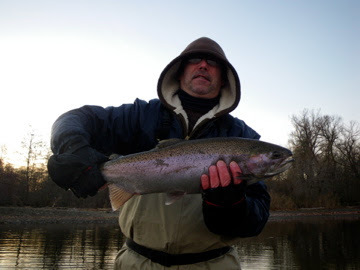 Big Poppa Pump's First Steelhead. 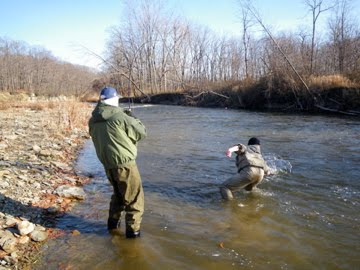 Having Gone Full Circle, A Steelhead is Released.